With their robust and compact design, our profile machining centres are used in the most diverse aluminium, PVC and steel profile machining applications, especially in the manufacturing of windows, doors, and curtain walls. An optional shuttle operation mode with alternating loading of the work areas – with doors, for example – increases productivity by up to 30 percent since the machine can be prepared for the next part while the previous part is still being machined. Profile surfaces are optimally protected: All operations, such as routing, milling, drilling and tapping, are performed while the profile bar is stationary (SBZ 151 to SBZ 122). Robust, low-wear direct drives on all axes allow rapid home positioning of the machining assembly at speeds of up to 150 m/min. 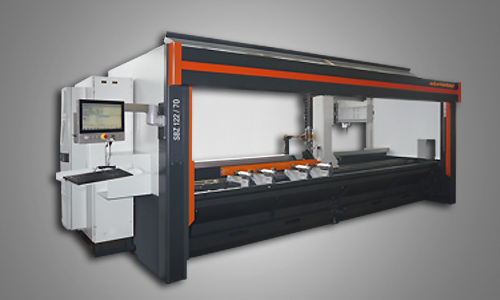 Profile machining centres with eluCam offer easy programming right on the machine. Alternatively, programming can also be done in the office using the comprehensive eluCad software.